Thus it is perhaps no surprise that this institution of the political billboard is expanding its reach from the general "remember who your leader is" sort of purpose into the more specific realm of public opinion. In this case, while the mass trial of Bahrain's 21 opposition figures has not even started yet in full, their guilt is already being proclaimed via massive billboards spread across the island. At that time, the following "terrorist organization" flow-chart was published in the Sept. 16, 2010, issue of the most hard-line pro-government newspaper, Al-Watan, said to be owned or at least supervised by the royal court. Having saved this newspaper clipping for all these months knowing that it would come in handy at some point, imagine my surprise when I see a near-replica of it in billboard form on the ground now in Bahrain. Sure, there are a few more names, and the text is different, but the idea and the message is recognizably the same. It even uses the same "Others?" technique that proved so illustrative in the Al-Watan flow-chart above. Thus it is difficult to escape the fact that either a) the maker of the billboard saw the article in Al-Watan and copied it, or b) the maker of the billboard is more closely related to the Al-Watan article. 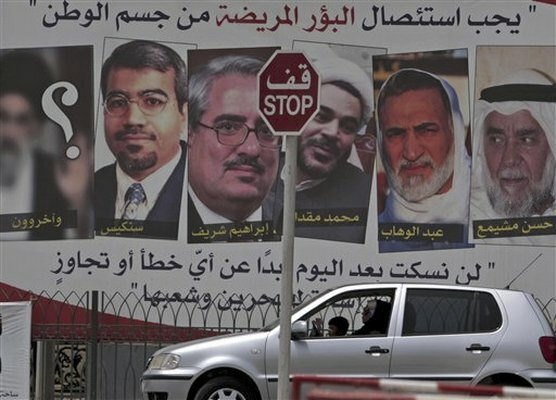 Located in Muharraq, the billboard of top opposition leaders al-Mushaimi', 'Abd al-Wahhab Hussain, al-Miqdad, Ebrahim Sharif, and al-Singace reads at the top, "Disease must be excised from the body of the nation." And at bottom: "We won't keep quiet after today about any mistakes or excesses by those who abuse Bahrain and its people." Nice. Finally, we have another billboard that purports to be not from the government but a request TO the government, from the Al-Hidd youth: "We request of the government... the greatest punishment: NO PARDON for the heads of fitna and the misguided elements." The noose is a subtle touch. The main lesson? 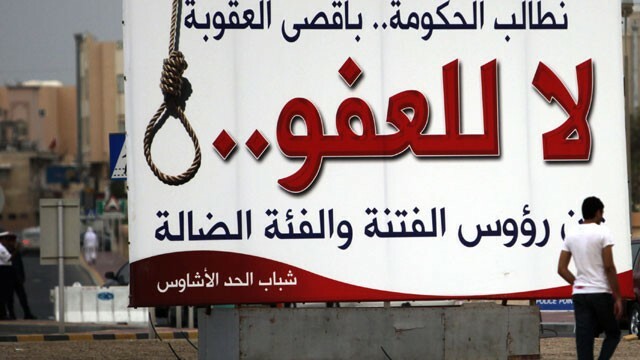 : Muharraq likes its political billboards. For more billboard madness, see this page from 2004, which among other things demonstrates that this is a tried and true technique. (Here is another, longer version.) 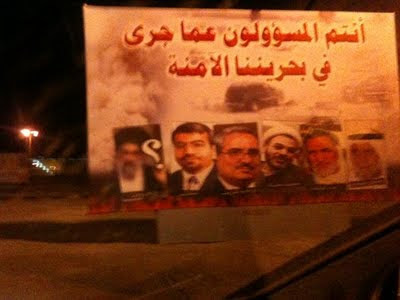 And if you have any Bahrain billboard favorites of your own, feel free to post them in the comments section and I will add them to the mix. "The best way to protect American interests is to tell both regimes [Saudi and Bahrain] that a continued security relationship with the United States depends on an end to policies of sectarian repression and on the implementation of moderate reforms. Meanwhile, it’s time to start looking for a new home for the 5th Fleet." 1.) Sign from al-Busaiteen invoking the sayings of 'Adal Flaifel and calling for the establishment of a "popular army" named Hamad's Popular Army; and, given the quotation below it--"For life, O Brothers and Sisters, gets its value from death"--is calling for martyrdom. From Wikipedia: Colonel Adel Jassim Flaifel ... is a former colonel in the State Security and Intelligence Service of Bahrain. He is accused of committing, or overseeing, acts of physical and psychological torture on Bahraini citizens from 1980s until 1997. He was released from his duties in December 2002 due to protests and pressures from human rights organizations worldwide. 2.) From August 2010 (and related to the "terrorist network" image from Al-Watan). "Justice and Law is a sword upon the heads of fitna and terrorism and those who play around with the security of the nation." 3.) More from the same time period, decrying the "terrorism" of tire-burning. "Quick! Evacuate the building! We've received reports that a burning tire is headed this way!" 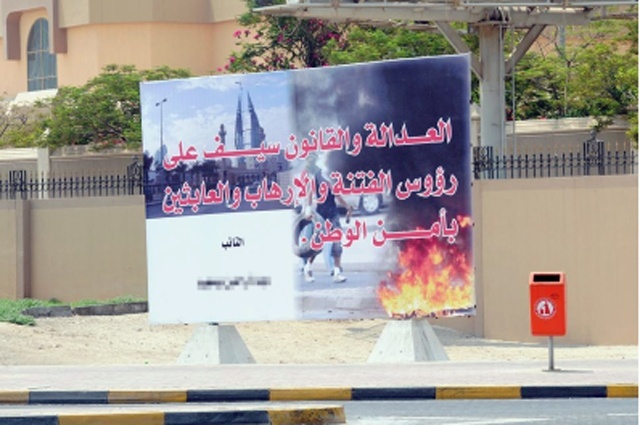 It lists some important quotes of Adel Falifel, the first is to orgnize civil militia in the name of "Hamad defense army"
It is also good to note that the blurred image used in the recent billboard representing "others" is actually a blurred image of Sayed Hadi al-Modarresi. If you look closely, you'll see it... Either way, it is provoking more sectarianism as even if you cannot recognize al-Modarresi from it, you can make out an image of a bearded man with a black turban. Just to wanted to say that I enjoy reading your posts. Please continue your nice work. Thanks. Actually I spent time looking for the one from al-Wasat. Thanks! Also, you forgot to point out that the blurred out photo behind the the "Others ?" box on the billboards is Iraqi Shia cleric Sayed Hadi al-Modarresi. Al-Modarressi was invited to Bahrain by the then ruler in the 70s to preach religion to offset the political influence of the leftists/nationalists. He was later deported from Bahrain and accused of planning a coup against the Al Khalifa regime. Yes I guess it is an upgrade from the blacked-out cartoon face from Al-Watan. Thanks for pointing it out and the for the new link. forever_zo..seems you are the only ignorant here that needs to get the facts straight ! google the name and you will find an identical picture of al modaresi ! !